Fadus Calidius is an Imperial warrior who can be found at the Skingrad Fighters Guild Hall. He offers basic training in block, but will only offer his services to members of the Fighters Guild. Similar to the other members of the Skingrad division, he hates Goblins and spends a lot of time training in preparation for future encounters with them. He sleeps in the upstairs area of the guild between midnight and 6am, after which he will enter the basement and practice his blunt skills for four hours. After that, he wanders around the ground floor for the rest of the day, talking with his guildmates, except when eating lunch for two hours at 12pm and dinner for two hours at 6pm. He is available for training at all times except when sleeping or eating lunch. He relies almost solely on heavy armor: iron boots, an iron cuirass and iron greaves. He wields an iron war axe as well as a fur shield and carries a small amount of gold. After you have signed up for the Fighters Guild, he will gladly introduce himself and his services: "I'm in the Fighters Guild, yes, and I can train for weapon and shield parries. Fadus Calidius is the name." And when you ask him about Skingrad, he can't help but to bring up his favorite subject: "What brings you to Skingrad? Hunting goblins? Sure, they're thick in the West Weald, but you'll find their holes all over Cyrodiil." Choose the new topic "Goblin Hunting" from his dialogue options, and he will mark Goblin Jim's Cave on your map with the following description: "You heard of 'Goblin Jim's Cave'? It's a big one. It's a long walk due north of Skingrad, in the Imperial Reserve... a long way from civilization." 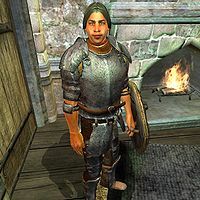 If you have read Modern Heretics or spoken with Ulene Hlervu about "Cheydinhal", a new "Daedra shrines" conversation topic will appear, and if chosen, Fadus will mark Sanguine's Shrine on your map with the words: "Yes, in fact, up in the Imperial Reserve, a long way north-north-west of Skingrad, I came upon a Sanguine shrine. Gave it a wide berth. I'm a goblin hunter. Don't want to tangle with those Daedra worshippers." The citizens of Skingrad have noticed Fadus’ block skills. When asked about rumors they may say: "If you need to learn how to use a shield, you should talk to Fadus Calidius at the Fighters Guild." and "Fadus Calidius sure can use a shield. I've never seen him take a hit!" They will also compare Fadus with the other Block trainer in Skingrad, Ambroise Canne: "Ambroise Canne is really good with his shield. Even better than Falus Calidus [sic], I think." Ambroise Canne himself will not hesitate to agree with the crowd: "Fadus Calidus [sic] at the Fighters Guild also teaches Block, but he'd be the first to admit I'm his superior in every way." Fadus has no evening wear and can sometimes be found walking around the Fighter's Guild in his underwear. Esta página foi modificada pela última vez à(s) 12h43min de 6 de junho de 2013.